This collection of essays seeks to reflect the many aspects of the life and work of William Walton. Written by acknowledged Walton scholars they cover the literary influences in his music and the current debates that surround them. 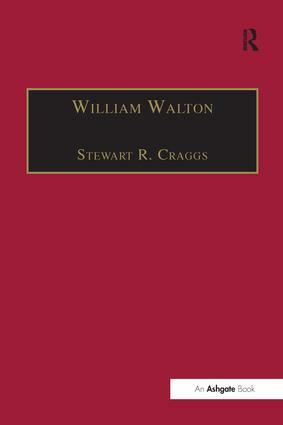 Walton’s particularly well-known compositions are examined, such as Belshazzar’s Feast, Troilus and Cressida and FaÃ§ade. Also included is an overview of his 14 film scores and an analysis of his first and second symphonies and his concertos. Contents: Preface Michael Pope; The Songs Alan Cuckston; Sacred Music John Coggrave; FaÃ§ade: a noise like amber Kevin McBeath; Belshazzar and BBC Bureaucracy: the Origins of a Masterpiece Michael Kennedy; The Symphonies and the Concertos Robert Meikle; Film Music Stephen Lloyd; 'All the things that might have been': Christopher Columbus Zelda Lawrence-Curran; 'A Lost Child': a Study of the Genesis of Troilus and Cressida Scott Price; Recorded Works Lyndon Jenkins; Walton’s Words Lewis Foreman; Bibliography; Index of Walton’s music; Index of names.